And the 7 days premium ? Have you logged in on your NCSoft account and applied the code? For those who registered, the code should be there ready to be applied. me too, can somebody help us out? where's free Character Slot Voucher? Well.. i registered when I got he mail back in august but nothing after that. No code no nothing. Got a mail 2 days before release about the new patch and so forth. In addition to the Warden registration, everyone that is opted in to receive Blade & Soul newsletters by September 12 will receive 7 days of Premium Membership and 3 Upgrade Emblem's for an in-game event (more details soon). You can check your account’s Email Preferences by logging into your NC Account settings. 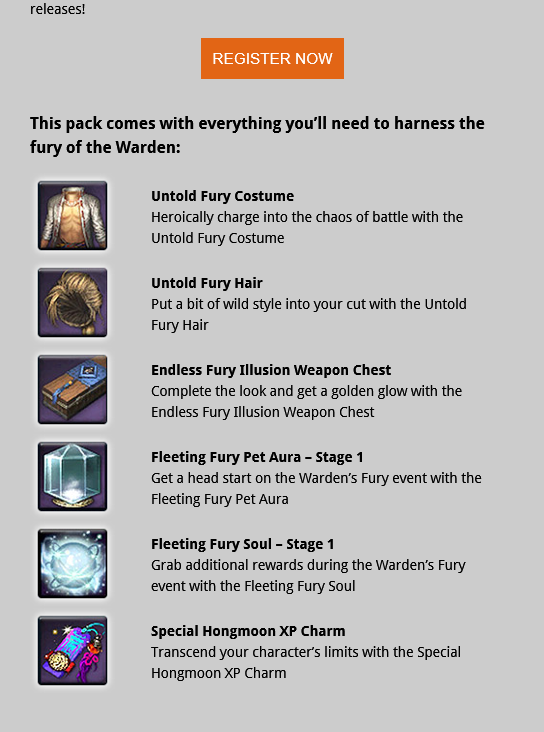 If you're already opted in to receive Blade & Soul newsletters you don't need to take any additional action to receive these free goodies! In addition to the Warden registration, everyone that is opted in to receive Blade & Soul newsletters by September 12 will receive 7 days of Premium Membership and 3 Upgrade Emblem's for an in-game event. Also there should be a free emblem in F10. Can mods explain the lack of premium then plz? Or an explanation on when it will be fixed?